Starting seedlings indoors has many benefits for gardeners and can increase the productivity and variety of your garden. It's not difficult, but does take some special considerations to be sure the seedlings can thrive both indoors and when they are transplanted. Satisfy winter gardening urges when outdoor gardens are not available. Extend the growing season in northern areas. Add garden variety by enjoying produce that needs more growing time. Enjoy an earlier harvest with staggered seedling plantings. 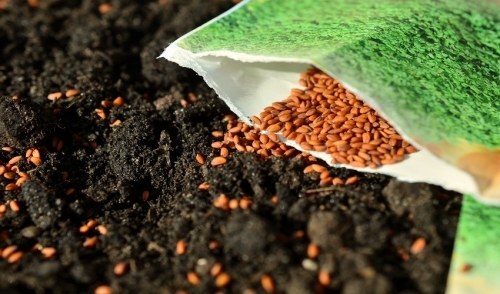 Save money by buying seeds rather than plants. Choose different plants than a local nursery may provide by buying seeds online. With so many benefits, there's no reason to not try starting seeds indoors and giving your garden a great kick start when the ground thaws in the spring. Choose fresh seeds from a reputable source, and never use seeds that are more than 1-2 years old, or they may not be healthy enough for strong germination. Plant seeds in small, individual containers no more than 2-3 inches deep. Divided planting trays are ideal, or you can use egg cartons, paper cups or similar containers. Use a sterile growing medium, such as peat, vermiculite or another seed starter that is porous to encourage root growth and lacks weed seeds or fungus contamination. Start seeds according to their growth and harvest instructions, planning for transplant after all local risk of frost has passed and the ground has warmed sufficiently. Mark seed trays or containers with the types of seeds in each to make care easier, and group seeds with similar needs together. Position seed trays in an area with sufficient light and consistent temperature away from vents or drafts, but allowing enough room for healthy plants as the seeds grow. Use supplemental lights to prevent spindly or leggy seedlings; grow lights will work, as will cool fluorescent lights, and they should be kept 2-4 inches from the plants. Consider a heating mat under the seed trays to keep soil warm and encourage better root growth for healthy seedlings. Water seedlings from below and keep them damp but not soggy, gently using a mister on the plants if necessary. Do not fertilize seeds until the first true leaves appear, then fertilize once a week to provide adequate nutrition for healthy growth. When seedlings are ready to be added to the garden, they must be hardened off so they can survive the transition to outdoor conditions. Every day, move the seed trays outdoors to a sheltered location, gradually increasing the time they spend outdoors from just an hour to most of the day. After 1-2 weeks of this process, the seedlings will be hardy enough to be transplanted, and the garden will thrive! Are you ready to try starting seeds indoors? Stop in and see us for all the best seeds, supplies and tips for successful plants!